McIntosh, Andrew et al. "Massey Hall". The Canadian Encyclopedia, 08 November 2018, Historica Canada. 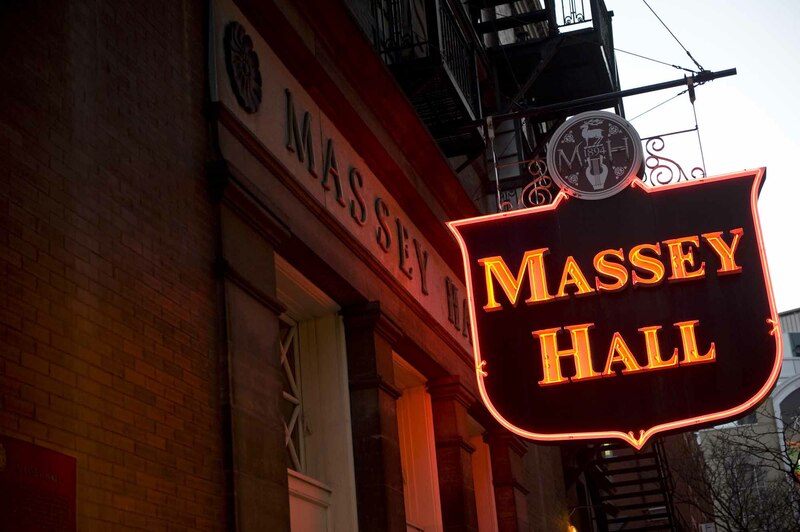 https://www.thecanadianencyclopedia.ca/en/article/massey-hall. Accessed 18 April 2019. Massey Music Hall, as it was known until 1933, was built by industrialist Hart Massey in memory of his son Charles Albert Massey (see Massey Family). The hall was gifted to the city of Toronto to foster “an interest in music, education, temperance, industry, good citizenship, patriotism, philanthropy, and religion.” Designed by Cleveland-based Canadian architect Sidney R. Badgely, it was constructed of brick under the supervision of Toronto architect George M. Miller at a cost of $150,000. Its interior design, in the Moorish Revival style, was inspired by the Chicago Auditorium and the Alhambra Palace in Granada, Spain (see Theatre Design to 1950). It opened on 14 June 1894 with a performance of Handel’s Messiah by a 500-member chorus and the 70-member Grand Festival Orchestra, conducted by Frederick Torrington. Seating consisted of an orchestra, two balconies, six private boxes, stage boxes, and tiered onstage seating, with a capacity of 3,500. Until the 1920s, when other cities began to erect concert halls, Massey Hall was the only building in Canada designed expressly for musical performances. 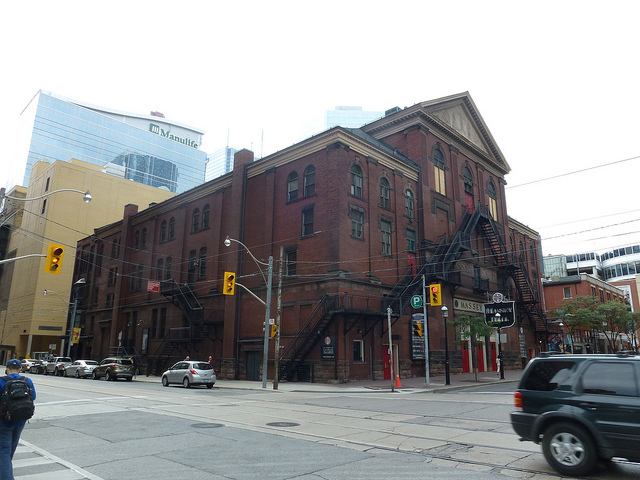 It became the home of the Toronto Mendelssohn Choir in 1895, housed the early incarnations of the Toronto Symphony Orchestra	(TSO) from 1906 to 1918, and was the permanent home of the TSO from 1923 to 1982. 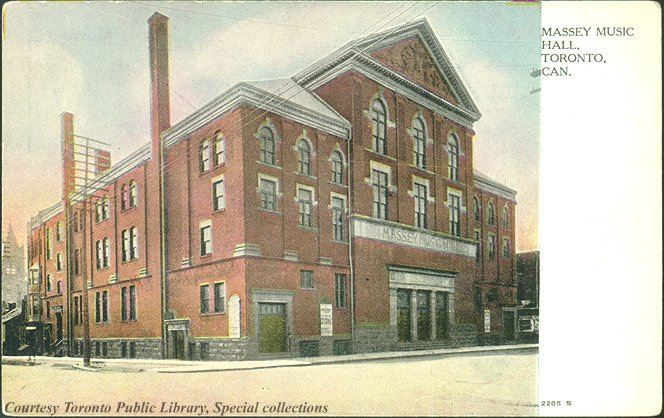 A postcard from 1910 featuring Massey Hall. The hall’s acoustics have been praised by audiences for their warmth and criticized by orchestral musicians for their deceptiveness. (A TSO musician once said that players could not hear each other clearly because of reverberation, and that consequently a focused ensemble was difficult to achieve.) Roy Thomson Hall took over the main functions of Massey Hall — namely, the performances of the TSO and the Toronto Mendelssohn Choir — when it was completed in 1982. Johnny Cowell’s “A Farewell Tribute to the Grand Old Lady of Shuter Street” was played during the TSO’s final concert at Massey Hall on 4 June 1982. In succeeding years, the number of events diminished to an average of two or three per week. The CJRT Orchestra held its annual concert series there from 1982 to 1991, the Kitchener-Waterloo Symphony, with Anton Kuerti, performed a three-concert series in 1986, and Taflemusik	began its annual Messiah performances there in 1987. However, rock concerts became the mainstay of Massey Hall’s bookings, which also included concerts by pop performers, ethnic ensembles, school choirs and ensembles, and a variety of community-based events. Massey Hall, 15 September 2013. The board of the Corporation of Massey Hall and Roy Thomson Hall administers both facilities, each of which has continued to function independent of any direct government subsidies. Massey Hall’s original archive of records, photographs and playbills was destroyed by flood in 1943. The contemporary records of Massey Hall are maintained as part of the archives of Roy Thomson Hall. A selection of some of the more memorable events at “the Grand Old Lady of Shuter Street” (the nickname Vincent Massey gave the hall in 1953) indicates the range of its use. There were notable appearances by Ignacy Jan Paderewski (1896), Adelina Patti (1903), Dame Emma Albani (1903, 1906), Enrico Caruso (1908), Luisa Tetrazzini (1912), Amelita Galli-Curci (1917), Jascha Heifetz (1917, the year of his teenage New York debut), and Kreisler (1934); speeches by Winston Churchill (1900, 1901), Carrie Nation (1901), Nellie McClung	(1919), and Lloyd George (1919); a concert by the London Symphony Orchestra under Arthur Nikisch (1912); the wedding of the Onondaga athlete Tom Longboat	(1908); an exhibition boxing bout with Jack Dempsey (1919); and a performance of Edward Elgar’s The Dream of Gerontius by the Sheffield Choir, conducted by the composer (1911). There were also movies, silent and sound; regular boxing matches; visits by touring opera, ballet and theatre	companies; annual May Festival Concerts (begun in 1894) by Toronto school choirs; countless folk, rock, jazz, choral, and symphonic concerts; recording sessions by the Toronto Mendelssohn Choir	during the 1950s; and performances by the world’s finest orchestras, including the Berlin, Vienna and New York Philharmonics, the Cleveland and Philadelphia Orchestras, the Concertgebouw of Amsterdam and the Royal Philharmonic of London. Oscar Peterson and a 13-year-old Glenn Gould made their Massey Hall debuts within weeks of each other in March 1946. 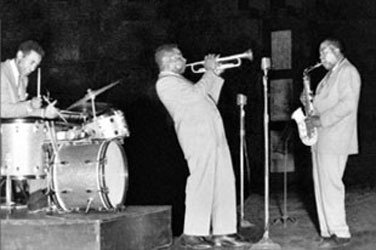 A legendary jazz concert at Massey Hall on 15 May 1953 marked the only time that Charlie Parker, Dizzy Gillespie, Bud Powell, Charles Mingus and Max Roach ever played together (it is considered by some the greatest jazz concert ever). In 1962, the CBC Symphony Orchestra and the Festival Singers of Canada performed Stravinsky’s A Sermon, a Narrative and a Prayer and 8 Instrumental Miniatures, conducted by the composer. Neil Young’s solo acoustic performance on 19 January 1971 was released in 2007 as Live at Massey Hall 1971 and became a No. 1 album in Canada. On 9 December 1973, Luciano Pavarotti made his Toronto debut in front of a packed house that had paid a record-breaking $50 per ticket. On 21 February 1974, Maria Callas and Giuseppe Di Stefano performed as part of their farewell tour. In 1975, the hall was used for a week to shoot a film about Bob Dylan that was never released. In June 1976, Canadian rock trio Rush recorded their first live album, All the World’s a Stage	(1976), which would go on to sell more than 1 million copies. The Centennial Celebration Concert on 14 June 1994 — commemorating the building’s 100th anniversary — featured the TSO, Toronto Mendelssohn Choir, conductors Mario Bernardi, Victor Feldbrill and Elmer Iseler, contralto Maureen Forrester, soprano Lois Marshall, folk-rock group Blue Rodeo	and humorist Dave Broadfoot. Gordon Lightfoot, the most frequently appearing artist in the Hall’s history, marked his return from illness in May 2005 by resuming his regular spring concert at Massey Hall (“the centre of my universe as a musician,” he has said), a tradition for the singer that stretched back to 1967. Lightfoot was also the headliner for the hall’s 124th anniversary celebrations. These began on 14 June 2018 with performances by Jim Cuddy, Sarah Harmer, Buffy Saint-Marie, Joel Plaskett and Sam Roberts, all backed by the band Whitehorse. The celebrations culminated with three nights of Gordon Lightfoot concerts leading up to 2 July, when the venue closed for two years for renovations. The first major structural changes to Massey Hall were undertaken in 1933. Seating was reduced to the current 2,765 by enlarging the lobby and adding the balcony lounge. Also in 1933, the building was officially recognized by its popular name, Massey Hall. A second renovation, undertaken in 1948, lowered the stage and replaced the wooden floors of the stage, basement, and orchestra with reinforced concrete. In 1955, after a large chunk of plaster fell from the ceiling while the Hall was empty, the entire ceiling was re-plastered and reinforced with a strong wire mesh. The interior was refurbished in the early 1980s, and the hall was air-conditioned in 1989 in preparation for a seven-month run of the Andrew Lloyd Webber musical Cats. Centuries Bar & Lounge, in the building’s basement, was introduced along with the sale of alcohol for the venue’s 100th anniversary in 1994. In January 2012, Toronto’s MOD Developments Inc. announced that it was gifting some of the base of its 60-storey mixed use Massey Tower condominium along Victoria Street to the concert hall. Adjacent to the south of Massey Hall, this seven-storey, 4,800 sq. feet podium will house a loading bay (something the hall has never had), a performance capture studio, technical facilities, an expanded backstage area and a live music venue with a 500-person capacity. The Centuries bar in Massey Hall’s basement will also be outfitted with a new, permanent stage to create a coffee house-style performance space, bringing the hall’s number of live music venues to three. These renovations, the most extensive in the hall’s history, began in 2013. They are part of a $142 million restoration project funded by the City of Toronto, the federal government	and private fundraising, and designed by KPMB Architects. To fully restore and update the venue, the hall will be closed for two years as of 2 July 2018. Many aspects of the building’s original design, including 100 stained glass windows and ornamental decorations on the arched ceiling and the hall’s exterior, will be restored. Seats will be replaced, leg-room will be increased and some sightlines will be improved (though the pillars will remain). The centre section of seats on the main floor will be made to retract under the stage to create a general admission space. The light-coloured stage, installed in 1948, will be replaced with darker wood. The attic will be redesigned to accommodate special lighting and effects equipment, thus diversifying the types of shows the hall can host. Acoustics will be improved by adding sound treatments to the wall and arches opposite the stage and to the dome overhead, and the bottoms of seat cushions will be perforated to absorb sound. The hall’s accessibility will also be modernized, with elevator access, bathrooms and accessible seating on every level. The second and third floors of the hall will connect to the seven-storey tower via glass corridors constructed on the outside of the building. It is estimated that the renovations will take 18 to 24 months to complete. 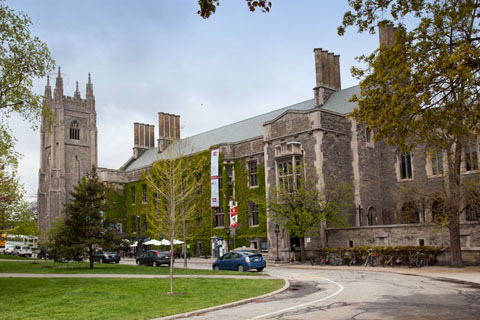 Massey Hall is scheduled to reopen in fall 2020. Venerable Concert Hall Massey Hall in Toronto with its well-known neon sign lit. It was completed in 1894 and designated a National Historic Site of Canada in 1981. Picture taken May 5, 2011. Massey Hall was named a heritage site by the City of Toronto on 20 June 1973 and was designated a National Historic Site	on 15 June 1981. John B. Withrow, the son of one of Massey Hall’s early managers, wrote a regular series of articles beginning in 1982 about the long, distinguished history of the hall for the periodical Bravo. William Kilbourn’s book, Intimate Grandeur: One Hundred Years of Massey Hall (1894–1994), was published in 1994.